Well, I've gone completely off the deep end with the Raleigh Competition GS. I've spent the last few days removing layers of grease and cat hair from all over this bike. Not really my neighbors fault - it has been in storage for about 20 years and collected a lot of spider webs and hair on an already greasy frame. Anyway, I've taken it all apart and fully degreased, cleaned and now waxed. It has come back to life again! So here is where I've gotten to. The original tires were 700 x 28's, designed for road racing. 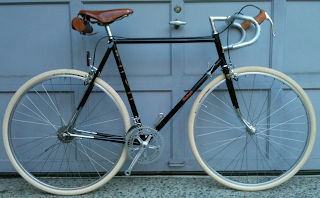 But I'm going for a bike that is somewhat like the Pashley Guvn'or. 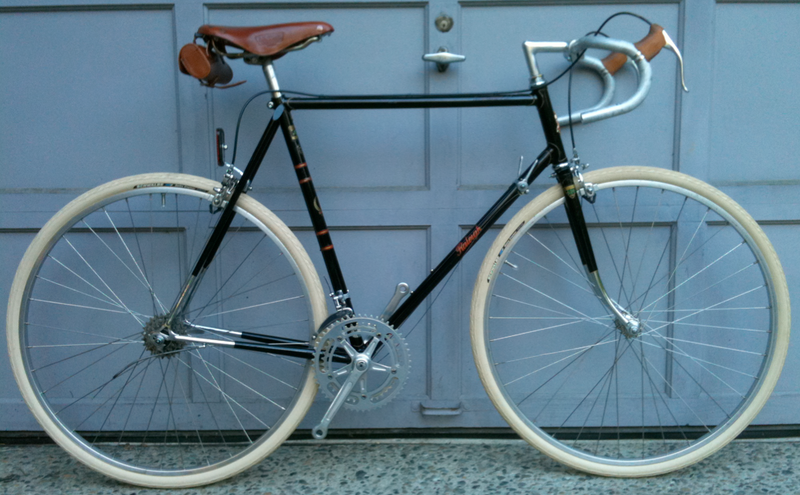 These are 700 x 35 Schwalbe Delta Cruisers in cream (I have a thing for cream tires these days I guess). These tires barely fit between the chain stays in the back, and no need to worry about fenders... they will not fit. At some point, I may move the Conti Gatorskins I have on my Surly over here and put the Deltas on that bike... make it a real cushy ride for commuting. This bike has taken a fall at some point. The frame is fine, but a couple of the components were in really tough shape. First was the brake levers - extremely scratched up. 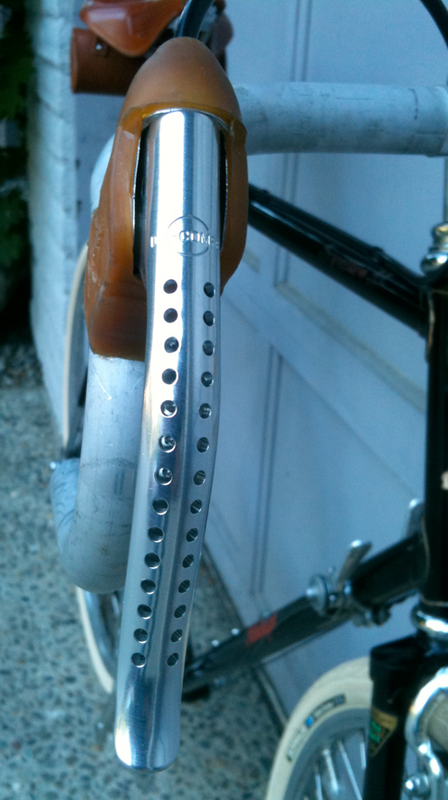 I ordered up a set of identical Dia Compe drilled levers from someone on eBay and they arrived almost the next day. Good thing about these levers were that they came with the original cable and housing as well. Saved a few bucks on this one. The cable/housing is a little shorter than I'd like, but it keeps it looking very sleek over the bars. So I have a few other things on the way... The rear changer was badly damaged in the fall too. It ground the top swivel nut into the body of the derailleur causing it to wobble in the hanger and not swivel.... not good. So I have another changer being shipped in from, well, Hungary. I know, I know. Off the deep end. I can't put it all together until the changer comes. The chain is in a pot of lubricant working out the years of grime. 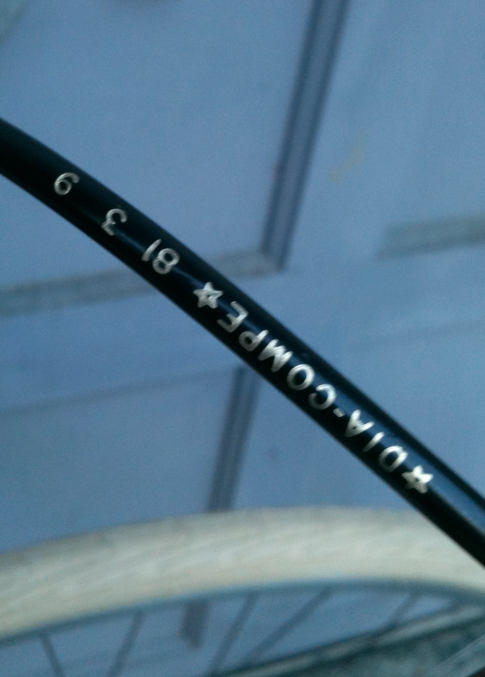 I can't wait till the new Campy Nuovo Gran Sport rear changer gets here and I can put the drivetrain back together. I shopped some Campy pedals from that era... sorry, just too pricey. I have a set of MKS Sylan Track pedals coming, with some stainless steel toe clips and leather straps. All via eBay. This will end up a truly international bike! Not to worry, there have been many updates to the bikes and I'm planning on updates soon. Stay with me! 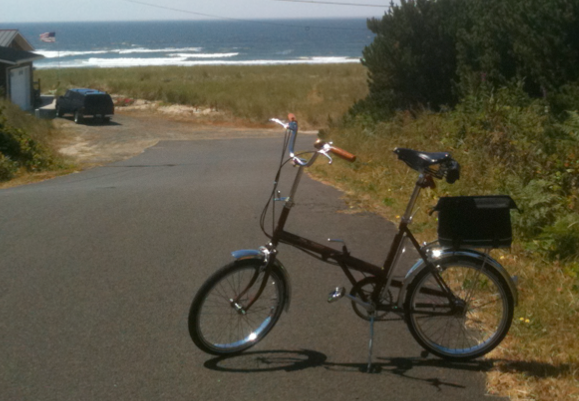 PS - a teaser... from Manzanita, OR. Lovely! !